A week ago somebody asked me if boiled honey was toxic. She knows that heating honey kills the enzymes and even makes it toxic! I was somehow shocked. But then, considering the fear we have all come to live in these days, thanks to stress, radiation, toxic over-processed food, drugs, medicines and so many others, the reaction on some extreme naturalists, who are totally against processed/heated food, is totally understandable. There is no wonder we have come to ask ourselves if it is safe to use honey in our cooking. I will refer here to what happens when raw honey is heated, or kept for too long and in light conditions. I do not talk about the honey we find in our supermarkets’ shelves, blended or not, imported or not. That honey is way too processed to be even called honey. I am referring strictly to raw honey and what happens to it after heating. 1. Effects on the antibacterial and antioxidant activity of honey. Under heat, some compounds of honey are destroyed, some are unchanged and some are greatly increased. • Non-peroxide activity, which is given by: the osmotic effect of sugars, pH and honey acids and others, such as: phenolics, carbohydrates, Maillard products, proteins, antibiotic-like peptides methylglyoxal, and other non-determined substances. – some are created during honey storage or heat (Maillard products). The peroxide activity of honey is destroyed by heat, light and storage. Stefan BOGDANOV in the 1984 study “Characterisation of antibacterial substances in honey” and to BLUMER, P and BOGDANOV, S in the 2001 study “Natürliche antibiotische Eigenschaften des Honigs.”, showed that contrary to the non-peroxide activity, the peroxide one can be destroyed by heat, by light and by storage. They showed the influence of these factors on the antibacterial activity of honey against Staphylococcus aureus. This is the sad truth. If you buy raw honey, really raw, but keep it improper conditions, you may lose up to 86% of its peroxide ability to fight microbes. Improper conditions? Light and age. Only fresh and unheated honey has optimum antibacterial activity. The non-peroxide activity in honey is less susceptible to heat and light. What makes the non-peroxide activity in a honey? 1. Phenolics and flavonoids, are considered to have antibacterial activity. In a study with Cuban unifloral honeys, the higher phenolic content tended to have a higher antibacterial activity. 2. The high sugar concentration of honey, and the low honey pH, are also responsible for the antibacterial activity. 3. Undetermined components of the water and methanolic extract of chestnut honey inhibit pathogenic bacteria like Erwinia carotovora, Yersinia enterocolitica, and Aeromonas hydrophila interfering in the quorum signal (QS) system of bacteria. The bacterial QS system is thought to determine the virulence of bacteria. The substances are thought to belong to the carbohydrate fraction of honey. 4. Carbohydrate break-down Maillard products, present in Canadian honey and probably also in any honey, have an antibacterial activity. These substances are also present in fresh honey. Yet, some studies say that with heat and storage these antioxidant and antibacterial activities decrease. 5. Antibacterial aromatic acids and 10-HDA, the main royal jelly acid with antibacterial properties have also been found in honey. 6. An antibacterial honey protein as defensin-1, which originates in royal jelly, was also found in honey. 7. Honey bacteria produce antibiotic-like antifungal peptide compounds, e.g. bacillomycin F.
8. 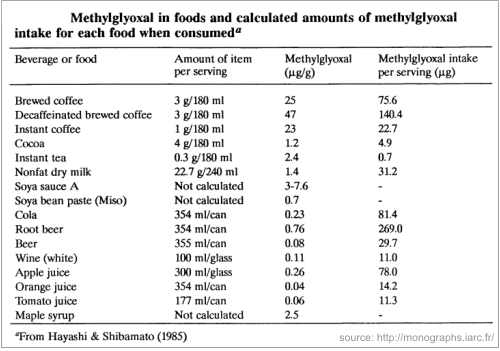 Methylglyoxal, probably present in all honeys, but found in a huge quantity in manuka honey. The strong antibacterial activity of Manuka honey is due to the presence of this substance. Reactions and added substances that occur after heating. Maillard reactions. I don’t suppose non-chemists know what these are. We don’t need to know the name of the process during which our meat turns to brown. As long as it gets flavor, taste and a brown color, we don’t care what chemical reactions happen there. According to scienceofcooking.com the Maillard reaction is a chemical reaction between an amino acid and a reducing sugar, usually requiring heat. And not any heat. It has to be above 285°F (140°C). The Maillard reaction is responsible for many colors and flavors in foodstuffs: caramel made from milk and sugar, the browning of bread into toast, the color of beer, chocolate, coffee and maple syrup. The browning of food is due to this Maillard reaction, which happen between an amino acid and sugar and should not be confused to caramelization, which is only the pyrolysis of certain sugars. Caramelization is the oxidation of sugar and depends on the type of sugar. Sucrose and glucose caramelize around 160°C (320°F) and fructose caramelizes at 110°C (230°F). Honey processing at high temperatures or its prolonged storage triggers the Maillard reaction that ultimately is responsible for a formation of high molecular weight polymerized brown pigments called melanoidins. • In 2005, Samoza showed that in vitro systems, melanoidins mixtures have negligible mutagenic effects. • The study from 2011, “Honey melanoidins: Analysis of the compositions of the high molecular weight melanoidins exhibiting radical-scavenging activity.”, by Brudzynski K and Miotto D, from the Department of Biological Sciences, Brock University, Canada, showed that melanoidins have radical-scavenging activity. The changes in the phenolic content of melanoidins from heated honeys were strongly correlated with their oxygen radical absorbance capacity (ORAC) values (R=0.75, p<0.0001), indicating that polyphenols contribute to the antioxidant activity of melanoidins. • This study, from 2013, made by Katrina Brudzynski, showed that melanoidins also appear during storage. It will involve a cascade of seemingly unguided redox reactions between amino acids/proteins, reducing sugars and polyphenols. • The study Effects of prolonged heating on antioxidant activity and colour of honey, made by Nihal Turkmen et al., in 2006, showed that antioxidant activity and brown pigment formation increased with treatment temperature and time. The antioxidant activity variation showed different trends according to heating temperatures. Heating of honey at 70 °C was found to be more effective than 50 and 60 °C for both two parameters. The results demonstrated that antioxidant activity was correlated with increased browning of the samples. Which translates into: the darker, the most antioxidant. Recent studies conclude that antioxidant and antibacterial activities depend on the stages of the Maillard reaction. At the intermediate stage methylglyoxal increases honey’s antibacterial activity and semiquinones and quinones derived from polyphenol auto-oxidation also contribute to the cytotoxicity against bacteria. But in the advanced stage, the antibacterial activity decreases due to the increase of cross-linking, formation of polyphenol-protein complexes and their incorporation into melanoidins. Bottom line, the Maillard reaction and the melanoidin formations are responsible for a gain-and-loss of antioxidant and antibacterial activities of honey. MGO is a toxic substance, and heat increases its quantity. Free MGO, MGO modified proteins and ROS have direct or indirect cytotoxic effects on bacterial cells. While this is good in treating wounds, these cytotoxic features could pose a potential risk to human cells (according to Majtan, 2011). The accumulation of either free or protein-bound MGO are connected to AGE (Advanced Glycation End products) which lead to the development or worsening of many degenerative diseases, including Alzheimer’s disease, cardiovascular disease, stroke, eye cataracts, cancer and diabetes. AGEs speed up oxidative damage to cells and alters their normal behavior. Yet, our body can detoxify this compound with the glyoxalase system. This enzyme system exits in any living creature, from the simplest life forms to mammals. Normally our body can detoxify these compounds, when they are found in some limited quantities. It is true, that MGO gathers in our body by means of our daily food. It’s a substance found in roasted coffee, soya sauce, wine, tobacco smoke (Moree-Testa & Saint-Jalm, 1981). Besides, it is also produced by many strains of bacteria present in the intestinal tract. (see why manuka honey, with high amounts of MGO is not recommended to people suffering from IBS) Our body can detoxify us from it, but the question is if it does that on any ingested quantity. MGO is found in huge quantities in manuka honey (up to 1750 mg/kg and it may increase in time). While this honey is considered to be the best in treating any kind of wound, scientists have not yet agreed if it is safe for ingestion. HMF is a controversial substance which appears in the initial stages of Maillard reactions, due to dehydration of sugars such as glucose and fructose, in the presence of amino acids. Very low amounts of this compound are naturally found in fresh sugar-containing foods including milk, dried fruits, caramel products, certain fruit juices, spirits, instant coffee and bread. After pasteurization, cooking or extended storage (especially in acidic conditions) the HMF concentration increases. The EU Directive (110/2001) and the Codex Alimentarius (ALINORM 01/2000) standards limit HMF to 40 mg/kg for honey produced under European conditions and 80 mg/kg for honey coming from tropical countries. HMF is an indicator of excessive heat-treatment, spoilage, and of possible adulteration with other sugars. Although HMF is not yet considered a harmful substance, the National Institute of Environmental Health Sciences nominated HMF for toxicity testing based on the potential for widespread exposure through consumed foods, and evidence for carcinogenic potential of other members of this class. As a result, many countries impose restrictions on maximum levels of HMF in food and beverages. • The study TOXICOLOGY AND CARCINOGENESIS STUDIES OF 5-(HYDROXYMETHYL)-2-FURFURAL IN F344/N RATS AND B6C3F1 MICE, published by National Institutes of Health, Public Health Service U.S. DEPARTMENT OF HEALTH AND HUMAN SERVICES, studied the effects of HMF [also known as 5-(hydroxymethyl)-2-furfural] on male and female rats and mice to identify potential toxic or cancer-related hazards. – no evidence of carcinogenic activity of HMF in male or female F344/N rats administered 188, 375, or 750 mg/kg. – no evidence of carcinogenic activity of 5HMF in male B6C3F1 mice administered 188 or 375 mg/kg. – some evidence of carcinogenic activity of HMF in female B6C3F1 mice based on increased incidences of hepatocellular adenoma in the 188 and 375 mg/kg groups. • Another study, from 2007, Hydroxymethylfurfural: an enemy or a friendly xenobiotic? A bioanalytical approach, by Michail K et all, from the Institute of Pharmaceutical Sciences, University of Graz, Austria, says that though HMF has often been studied for its potential toxic, mutagenic, and carcinogenic effects, recent clinical studies, however, have strongly suggested that HMF might have exciting antitumor potential. While some studies say there is no evidence of carcinogenic activity (in mice), other studies say HMF can even have antitumor potential. National Institute of Environmental Health Sciences nominated HMF for toxicity testing based ONLY on the carcinogenic potential of other members of this class. From here, imposed restrictions on maximum levels of HMF in food and beverages followed. I can only hope that there will be other studies which will decipher the mystery, and the authorities will take the right decision. Till then, we know for sure that after heating, honey has an increased quantity of HMF. There are no evidence to suggest that this substance makes honey toxic. Yet, at least until they decide if HMF is carcinogenic or not, let’s not boil or bake our honey for 4 hours! 🙂 And of course, this applies for all our cooking. HMF does not appear only after cooking honey, but all the rest of the food as well. So, yes, heating honey kills enzymes. Read more about Enzymes in honey. Minerals are known to be heat resistant, yet they decrease too, with the exception of magnesium. – The study Effects of Processing on the Pollen and Nutrient Content of Honey, from 2013, showed that the process of heating honey may eliminate moisture, thereby increasing the concentration of minerals and antioxidants. – Delgado-Andrade et al. showed in 2011 that the bioavailability of minerals can also be affected by Maillard products, since these compounds are able to chelate minerals interfering, therefore, with their solubility. It was also observed a negative influence on dietary phosphorus absorption in male adolescents exposed to a rich-Maillard products diet. Magnesium and calcium bioavailability can also be affected by the presence of Maillard reaction products in the diet. – Garcia et al. showed in 2009 that significant decrease on dietary iron availability occurred when diets rich in Maillard products were consumed. A major consequence of the destruction of essential amino acids or the decrease in their bioavailability, is protein nutritional impairment, one of the oldest known nutritional implication of the Maillard reaction (Delgado-Andrade et al., 2007a; Seiquer et al., 2006). Rerat et al. showed in 2002 that the decrease in the availability of several amino acids, mainly lysine is quite noticeable, almost 50%. According to Katrina Brudzynski in 2013, six-month storage decreased the protein content by 46.7% in all tested honeys (t-test, p<0.002) with the rapid reduction occurring during the first three month. also read how is honey processed. In Ayurvedic philosophy honey is used as a sweetener and a dosha balancing food and it is never heated. It is believed that when honey is heated it creates ama in the body – ama being considered a toxic waste in the body, putting stress on the digestive system and liver. 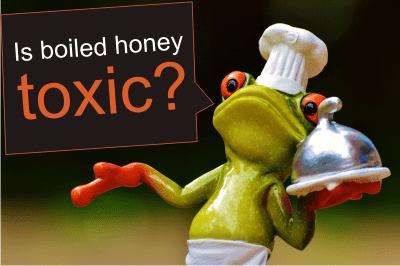 So, here is the answer Indians will give you: Yes, boiled honey is toxic. If not heated too much and for too long, honey is not toxic. It is definitely changed. Some good compounds decrease, others change a bit and others appear. With good features and bad ones. Mostly bad. But it doesn’t become toxic. You’ll not get cancer or other terrible disease, because you have once cooked roast turkey with honey. Or use it to make gingerbread. But if you can avoid heating the honey, please do so. You can use honey in a hot tea, when you have a cold, but in your usual daily tea, try and pour honey after the temperature of the tea lowered to approx. 40ºC. You can feel this with your tongue. It’s a pity to destroy the perfect composition of a raw honey. Also, very important. Not only heat destroys the honey. Light and storage do this, too. Buy raw honey from your locals. Keep it in a cool, dark place. Eat it quickly! BOGDANOV, S (1984) Characterisation of antibacterial substances in honey. Lebensmittel-Wissenschaft + [i.e.und] Technologie.Food science + technology.Science + technologie alimentaire 17: 74-76. BRUDZYNSKI, K; MIOTTO, D (2011) The relationship between the content of Maillard reaction-like products and bioactivity of Canadian honeys. Food Chemistry 124 (3): 869-874. How to lose weight fast and naturally. See what are the horseradish benefits for health What is citrus honey? Please I want to know, is my 1st time of hearing that cooking with honey is not good but I have already finish cooking with it and even eaten some of the food and the rest are in the refregerator please it is good to consume the rest in the frige or ????? You shouldn’t worry that much, really. Raw honey is considerate healthy when eaten raw. It benefits your health and even heals some disorders. With heating this honey remains more a food than a medicine. Honey found in our supermarkets is heated so it’s only sweet food. If you cook with raw honey you turn it into simple food. Its composition changes, some good things are lost, others (not necessary bad) are increased. The problem seems to be raised by the MGO and HMF quantities. MGO is much praised in manuka honey (and a heated honey doesn’t even get near the quantity found in some manuka honeys) as an antimicrobial factor, and HMF, though considered toxic, was proved by some studies to have antitumor activities. Anyway, you can cook with honey, I suppose you don’t use tons! But it is indeed recommended to not cook it at very high temperatures and for long periods of time. If we heat honey and make it to cool,can we use that honey after sometime? I also heard that keeping honey in the freezer is one of the way to differentiate adulterated honey. The real honey will only become thicker due to the low temperature while the adulterated honey will be frozen due to the water content in it. Yes, that’s perfectly true. You’re quite an expert. 🙂 I am going to try the freezing method over winter myself, though considering the quantity of honey we consume, I’ll need a huge freezer! Thanks for stopping by, CK. In the fridge the transformations are slowed down, though it will rapidly crystallize. The best way to preserve fresh raw honey is to freeze it. Under 5°C honey will freeze but not crystallize and the original texture and flavor will be preserved indefinitely. The good thing is that it will not freeze solid. It will, of course, get thicker as the temperature becomes colder, and while still appearing or even feeling solid, it will continue to flow at very slow rates and we will still be able to scoop it. I haven’t tried this storage method yet, but people say we need a bigger recipient, as honey will increase its volume in the freezer. This seems the best way to store honey for the winter period.